In this 5-week class, Ed Sikov will help you turn journal entries and personal essays into magazine quality work. What do hip, contemporary authors like Chuck Klosterman, Dan Savage, and Malcolm Gladwell have in common with all-time favorite public intellectuals like Michel de Montaigne, Ralph Waldo Emerson, and George Orwell? It's the ability to succinctly convey non-fiction truth through a strong personal lens. Along with powerful female peers, like Margaret Atwood and Susan Orlean, all of these authors have mastered the art of the essay. This often misunderstood word goes well beyond the dry, formal, mini-research papers everyone was suffered to produce in school. True masters of the form have the skill set to write compelling memoir, short articles, blog posts, opinion pieces, movie reviews, and you-name-it topical treatments. Powerful short non-fiction is always in demand. This is your chance to immerse yourself in learning the same skills with a current master of the form. The biographer, film critic, professor, and memoirist, Ed Sikov, will show you not only how to capture your thoughts in a way that serves a larger audience, but also how to get away with writing about your favorite subject: you. From figuring out the one incident or set of experiences in your life that’s most tellable and sellable, through learning how to structure an autobiographical essay, to honing it into a final draft, Charming with the Truth will show you how to write about yourself to a publishable style and standard. Ed has worn his heart on his sleeve with his students for his entire 25-year teaching career and will answer any question honestly and without shame. Let him show you how to share your deepest and most personal stories and observations without looking egomaniacal or desperate for attention. Ed will guide the whole class to support each other with respectful and constructive criticism in the pursuit of deeply personal non-fiction writing that sells. Week 1: Why would anybody want to read about me? Finding your own true tale to tell. Week 2: Seeing the David within the block of granite: You’ve got the tale, now find the details. Week 5: The final draft: the one that’s ready to send to editors looking for reasons to say “no”; the trick is not to give them any. Produce a polished 3500 to 4000 word autobiographical essay suitable for publication in an anthology, literary journal, or as part of your own book of memoirs. Lectures: This is where instructors post their lectures. Read the current lecture and return to re-read it as much as you like. A link for previous lectures will take you back to them even after new instructional material gets posted. Assignments: Assignments get posted in conjunction with similiarily themed lectures, but live under their own tab where they're easy to find. Each has a deadline, but students can login to work on them in a flexible way that accommodates any schedule. 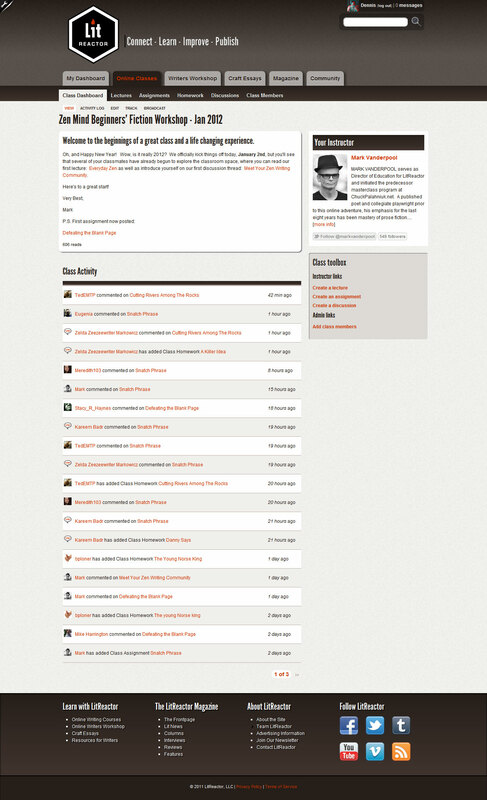 Homework: Students can see all the assignments thus far submitted on the Homework page. It's just another name for Assignments, but gives you one convenient place to find them all after they're turned in. This helps students help each other through cycles of peer critique. Discussions: A forum for students to discuss the class. Also a place where instructors can engage with students in less formal topics. Class Members: A great place to see a roster of all the students currently enrolled in the class. Take a tour of our online classroom to see how it all looks and feels. We trust you won't scratch anything. Ed Sikov was recommended to LitReactor by topflight literary agent Edward Hibbert--agent to Christopher Bram and Chuck Palahniuk, as well. 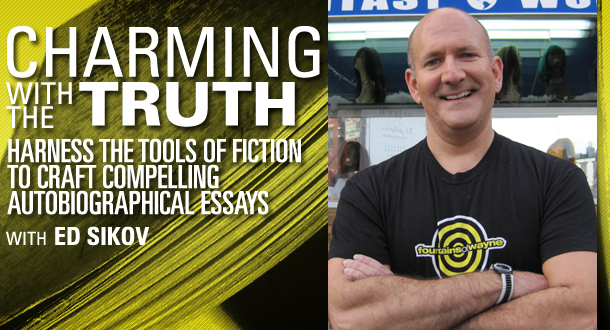 Charming with the Truth, a brand new offering exclusively for LitReactor, promises to tap the experience and insights of Ed's many years as an author and educator. Sign up now to be among the first emerging authors with testimonials featured here.